What a beautiful day for the Groundbreaking for our Veterans' Memorial. Special thanks to Chairman Daron Cannell, Mayor Dean Woodruff, and other committee members Dan Kretzer, Steve Arnsman (from the Mendon Lions), David Witter and Raymond Cantrell.Thank you to Emma Hildebrand for singing the National Anthem and to the American Legion Honor Guard for their participation. Thanks also for the prayer offered by the Rev. Bruce Willard of the Mendon Congregational Church. Special thanks to Danyelle Harrison of Harrison Monuments for sharing the design for our monument. Thanks also to WGEM, KHQA and the Mendon Dispatch for providing coverage for our groundbreaking ceremony. May 27, 2017 - Veterans' Memorial Groundbreaking Ceremony! 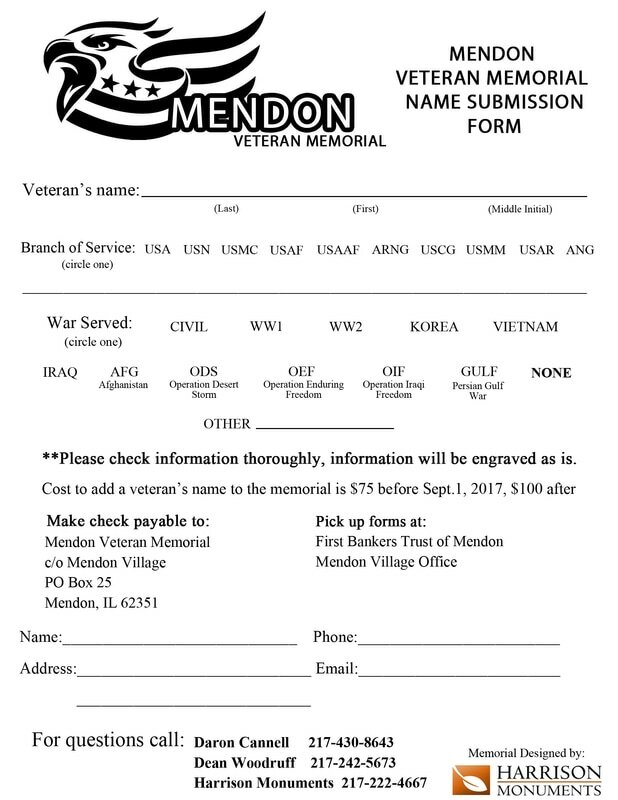 The Village of Mendon is excited to announce that they will have a Veteran Memorial constructed in the city park by Spring of 2018. This memorial will allow individuals to honor any veteran, living or deceased, active or inactive that was honorably discharged from the military. This will include their full name, branch of service and any war that they served in. Harrison Monuments will be constructing this impressive memorial using a composition of jet black, all polished granite as well as grey granite. This monument will stretch over 16 feet in length. It features a stunning laser etched American Bald Eagle using their in-house laser etching system. The American Bald Eagle symbolizes strength, courage, freedom and immortality and is encompassed in a striking border containing stars with the American Flag as its backdrop. Additional light grey tablets are flanked with pieces of jet black granite containing impacting images representing various conflicts and military branches. The lettering DUTY, HONOR, COUNTRY will be engraved into the stone along with powerful quotes from past Presidents of the United States, reminding us to understand and appreciate those veterans that sacrificed for our freedom that we enjoy today. A person can add a veteran’s name on the memorial for $75 before Sept. 1, 2017 or $100 after this date. 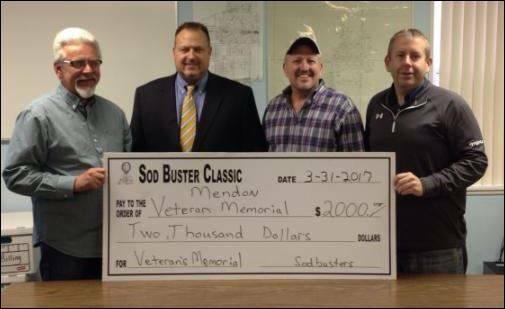 If you have questions please call committee members Daron Cannel at 217-430-8643 or Dean Woodruff at 217-242-5673.
to the Sodbuster Classic for their $2,000 donation to the Mendon Veteran's Memorial. THANK YOU SO MUCH!